The perfect machine for Sewists, Quilters & Embroiderers! 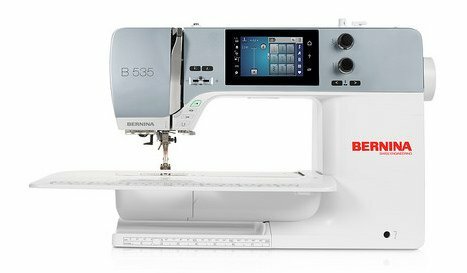 The BERNINA 590’s automatic features save time: No manual thread cutting, press a button to lift the foot, and press a button to cut your thread! The automatic thread cutter operates three steps in one: cuts the thread, lifts the needle, and raises the presser foot. Perfection is the new standard with no manual trimming on the top side, manage thread cuts easily, invisible secure for perfect results. Thanks to the Thread Away Mode and Invisible & Smart Secure, clean embroidery results on the top are yours with the B 590. Sew quieter, faster, longer, better to achieve perfect stitches with the help of your Jumbo bobbin! The BERNINA Hook keeps the stitches consistent and precise with a maximum speed of 1,000 stitches per minute. Easy design positioning: Position your design easily and exactly, no need to use the template anymore, and perfect results in short times. Use Pinpoint Placement to position your design precisely on the hooped fabric. Sew chiffon & leather like a pro! Handle all kinds of material with ease. Superb fabric feed on top and bottom which makes this machine excellent for slippery or fine materials. 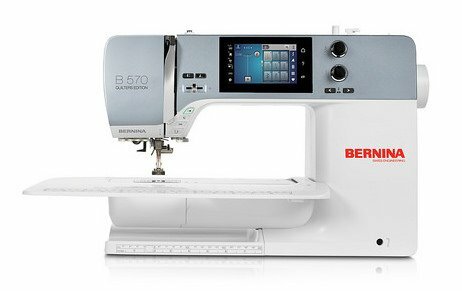 The innovative BERNINA Dual Feed feeds the fabric evenly from above and below. This machine is easy to engage and tucks away when not in use. Love to quilt? So does the B 570 Quilters Edition. Great tension for precise stitching as dual feed feeds the top layer and the bottom layer of fabric equally without puckers. The B 570 QE with its extended free arm offers 8.5" right of the needle. Perfect for handling big quilts with ease and enough room for comfortable quilting and creativity. Keep your hands on the fabric to adjust your quilt safely and quickly. Rotate, turn & do appliqués easily! Thanks to the hover function the foot raises, but the needle stays in the fabric, making it easy to maneuver and turn as you appliqué and quilt. Achieve perfect, equal length stitch results in no matter which speed you use. The BERNINA Stitch Regulator guarantees precise stitch quality and results at any speed during free-motion quilting. The thread is cut automatically, which saves a lot of time for creative ideas and a stronger focus on your quilt. Quilters love Patchwork foot #97: Designed for straight-stitching, ideal for sewing ¼" seam allowances, and extra insurance to experienced piecers. The Patchwork foot #97 is the special accessory for the most accurate feeding and stitching when piecing patchwork blocks. Made especially for Sewists. Sewing is very simple and easy with the BERNINA 535. The touch screen is easy to navigate, where you can find a huge selection of stitches and various sewing alphabets. Get the right pressure every time! Sew any material with ease and increase pressure for thin materials or reduce pressure for thick materials. Ensures that the ideal pressure is always used for the selected stitch. The basic setting can be individually adjusted. The B535 provides perfect tension for perfect stitches. With precise & powerful sewing, just sew without any worries and achieve beautiful stitch results. Thanks to the Adaptive Thread Tension you get optimal thread tension for perfect stitch quality on both sides of the fabric. More space for creative freedom with the extended free arm that offers 8.5” right of the needle. 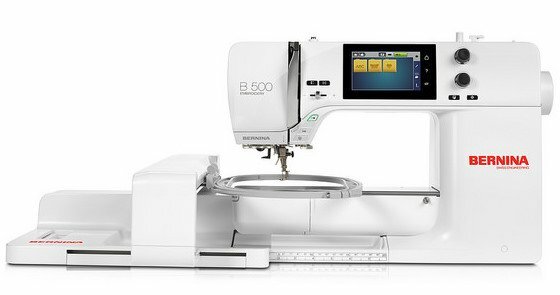 You can enjoy grand sewing with grand ideas because the B535 is built for an optional embroidery module. With the colorful touchscreen and simple navigation, users can access on-screen support when needed. The Sewing Consultant helps you to find the right settings and you can adjust suggested alterations quickly with the multi-function knobs. Sew quieter, faster, longer, better with your Jumbo bobbin and 5.5 mm stitch width. The BERNINA Hook keeps the stitches consistent and precise with a maximum speed of 1,000 stitches per minute. You’ll have extra time to spare by utilizing the automatic thread cutter, which operates three steps in one: cuts the thread, lifts the needle, and raises the presser foot. Made Especially for embroiderers. With touchscreen navigation, you can simply undo and redo steps, customize the stitch-out sequence, and edit your designs with ease. The B 500 provides more space for creative freedom. The extended free arm offers 8.5" right of the needle. Enjoy a large embroidery area of 15.75" x 6.5" to bring your embroidery ideas to life and handle large projects with ease. The automatic thread cutter operates three steps in one: cuts the thread, lifts the needle and raises the presser foot. The BERNINA 500 utilizes the Thread Away Mode and pulls the threads down to the underside for clean embroidery results on the top. The finest embroidery results are waiting for you with perfect stitches, a Jumbo bobbin to embroider longer, and a BERNINA Hook keeps the stitches consistent and precise with a maximum speed of 1,000 stitches per minute. Easy design positioning. Position designs easily and precisely, no need to use the template any more thanks to the use of Pinpoint Placement to position your design precisely: select two points and match them with the markings on the hooped fabric.